‘Structures’ means anything above ground which is not actually in contact with the sea or a burn. In other words: houses, garages, barns, studios, medical centres, commercial and light industrial premises and so on – anything up to 2½ storeys high. What about fire? A straw bale structure is more resistant to fire than many other conventional structures. The analogy often used is: ‘like trying to burn a telephone book’. One professional test gave a straw bale wall a fire resistance of over two hours – a domestic door is rated for 30 minutes. And what about rats and mice? They love voids, but in a properly built straw bale structure there are none. There is an apocryphal story of a straw bale householder taking off the cover of an electrical fitting and finding a family of desiccated mice behind it. Straw and clay mixtures – typically sun-dried bricks – have been used for thousands of years. When a brick dated 3000 years old was broken apart, the straw inside was still as bright and golden as the day it was made. The oldest straw bale houses in the world are around 130 years old; the oldest European straw bale house – in France – dates back to 1921. They have been built in the UK for around then to fifteen years. Building-grade straw bales are the old rectangular version and need to be as tight as possible and stored in dry conditions. Barley, oats and wheat are all suitable, with a slight preference for barley as the straw is kinder to the hands. In good years the bales can come straight off Orkney fields. There is only one specialist tool needed, and that is a baling needle, easily made by blacksmiths and most farmers. You need basic carpentry – the ability to cut wood and Sterling board straight and at right angles and screw them together. The roof, however, will need a bit more skill. Although you could learn from books how to build with straw bales, it is much better to go on a practical course. These courses are not expensive and are also a lot of fun, and you get to meet folk from different walks of life. (It’s how I started and became infected with the straw bale idea.) There are two or three organisations which run these – googling will find them. I discovered Straw Works – the main teacher has the patience of Job and is a super teacher. Apart from needing a structural engineer’s report, there are no unusual problems here. As with all structures, it needs to be well drained. Lack of adequate drainage was one of our problems. Ideally you will need to follow standard Orkney practice and point the smallest side into the wind. Because of the significantly lower weight, the foundations do not need to be as deep nor do they need to be concrete. Our house in Orphir has foundations which are compacted crushed rock. Clay is beautiful. It is the most forgiving material I have ever worked with. It is ideal to the beginner, since if you decide that you’ve made a complete mess of it, you can scrape it off, remix it and re-apply. Failing clay, then it has to be lime. Never ever cement. Lime renders and plasters breathe – cement doesn’t. So when (not if) you get water coming in through leaks or micro-cracks in a cement render, the water stays there. The aggregate for these plasters needs to be selected with care. External renders need a sharp sand. Beach sand can only be used for an internal-finish plaster coat after it has been very well washed to get the salt out. Failure to wash it will encourage damp. Damp is a vicious enemy of straw! The main building material can come straight off our farmers’ fields with no additional treatment required apart from, being harvested and stored in the dry. This is a big cost saving. You don’t need any cement at all! So again, you reduce costs and help the environment. The work can easily be done by a husband and wife team. Insulation, both thermal and acoustic, is superb. Scottish building regulations now call for a µ value of 0.25 across the walls. Not so long ago it was 0.45. The builders will be familiar with this, but µ is a measure of how good the insulation is, and the lower the number, the better. A straw bale wall rendered on the outside and plastered on the inside has a µ of around 0.13. That makes the house very cheap to heat. Another factor contributing to cheap running costs is that the airtightness of a straw bale house is superior to the ‘silver standard’ of the construction industry – in a nutshell, fewer draughts. This makes it a very comfortable house. A further aspect of being comfortable is that the renders and plasters used ‘breathe’, unlike cement and gypsum. So unless you go out of your way to introduce a lot of plastics and so on into the house, it will not suffer from ‘sick building’ syndrome. Speed of construction. This is very fast, so much so that the term ‘baling frenzy’ has been coined. This is where a work crew realises just how fast the walls can go up, then push themselves to go even faster. The walls of our house in Orphir reached first floor stage in a week. This was also a training course, with a lot of the time being used up in teaching. Orkney weather! You must keep the bales dry at all times, especially from the top. So every evening all work needs to be covered up with tarpaulins and uncovered the next morning. That is the usual method used in the south. However there is an alternative and that is the ‘Roof First’ technique. This was used in the construction of Europe’s biggest straw bale structure. Here the roof to a water-shedding layer is built directly on top of the straw bale wall-plate. This has the advantage of the joiners who build the roof doing so from the ground, which is quicker and easier, and also saves scaffolding hire costs. The roof is then jacked up bit by bit, to allow the bale walls to be built, then lowered onto the completed walls. You now have an umbrella to work under and so are not nearly so reliant on favourable weather. 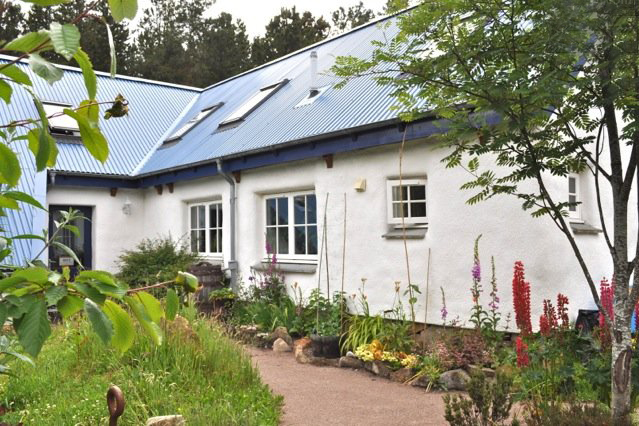 You can visit Nick’s house, along with his ground source heat pump and wind turbine, on the afternoon of Sunday 10 September, when two tours by minibus are being organised by Home Energy Scotland. There are two tours, one departing from Kirkwall at 12 noon (returning at 2 pm), and the second departing at 2.30 pm (returning at 4.30 pm). The pickup point is the old coach station, Great Western Road. Places are free but limited, and booking is essential, through this link.